Above and beyond traditional definitions for what the Baby Boomers and WWII Generation grew up calling a Megalomaniac is a new definition of public figure as well. A new classification of Narcopath has also emerged to define a Narcissistic Sociopath (separately identifiable from the terms Dark Triad or Malignant Narcissist). Understanding Narcopathy is an emergent academic research discipline evolving in part due to the widespread epidemic of NPD and ASPD sweeping not only across the United States but also globally. Considered emotional terrorists, Narcopaths typically take great pleasure in being in positions of power — places they should never be due to their inability to reign in capricious greed. Why do they constantly seem to be at the core of their own drama-creation, complaining that they are getting wet after manufacturing chaos and their own crazy “hit the fan” storms? The answer to that question lies in the truth of their fundamental biological nature. They manufacture chaos out of sheer boredom, plain and simple. Ask any family member of a Cluster B person. Narcissists lack the ability to feel a wide range of emotions. Sociopathic people’s ability to comprehend or detect emotion in themselves is even less. Both personality types can be successfully socialized to mock empathy — meaning to pretend to have a conception of what it means to be in another person’s position — but neither personality type can actually feel it. The pain an average human being is able to fundamentally understand, feel (themselves), or at the very least intellectually comprehend is by nature a maternal sensation. Sympathy — on the other hand — is less feeling and more logically paternalistic in nature. Narcopaths, like the Megalomaniac personalities of many elected rulers, religious authority figures, and political figureheads of the past, can learn how to mimic but at the end of the day not only are they functionally incapable of feeling “the feels” (as Spartan Life Coach Richard Grannon terms them). They are completely incapable of feeling guilt, shame, or logical remorse for engaging in hostile, covert, or destructive acts. Narcopaths indulge themselves in making chronic mischief for no other reason than to hyperstimulate their own emotions. By indulging in acting sadistically and with expressed malice with alarming regularity, they ensure anyone who knows them well learns to fear rather than love them. Machiavellian in the worst of senses, they seem to have misunderstood the famous quotes Niccolò Machiavelli immortalized in his classic social and political philosophy analysis work “The Prince”. When Machiavelli suggested that it is better to be feared than loved if you expect to retain any position of power, the message that being RESPECTED and loved was lost on any and all historical power-mongers. People who have or historically were known to have had difficult or malicious personality disorder values we now in the 21st century can learn to recognize as nothing more than terminal thinking patterns being demonstrated by people with Cluster B personalities. While the concepts of “Grandiosity” and “Entitlement” (with a capital E) permeate discussions about Megalomaniacs, the new title of NPD combined with a socially destructive impetus to rise to power at the expense of other human beings makes a great case for the DSM to consider incorporating the new hybrid term #NARCOPATH into their compendium of diagnostic analyses. If the term Narcopath was formally added, it could be a life saver for victims of people who have comorbid NPD and ASPD personality affectations. But the term should not simply be added for self-help readers edification. In order to help therapists, psychologists, psychiatrists, and mental health professionals worldwide learn how to both identify and spot the red flags and warning signs a person has a uniquely toxic “predatory” personality, they, too, need to be educated about how to distinguish the personality type by observing behaviors and noting relevant symptomatology. Why is it crucial for the mental health care industry to learn how to spot various types of Cluster B individuals — including notations about personality symptoms and pattern behavior for people with comorbid conditions? 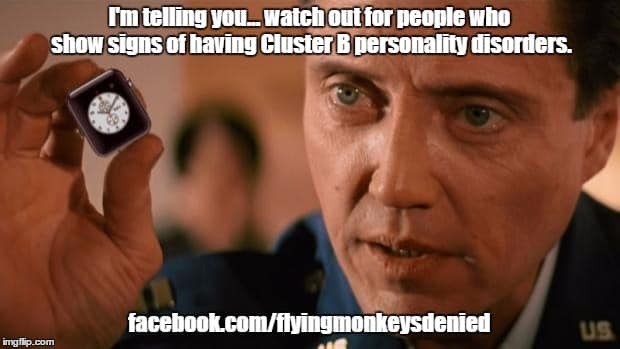 Because over 10% of the global population in 2015 is/was estimated to have some type of Cluster B personality disorder. Statistics — thought to be grossly underreported — have been confirmed, with some sources suspecting up to or slightly over 20% of the global population is likely to be affected physically. That is a whole lot of family members, friends, co-workers, romantic interests, men, women, and children who are likely to experience trauma due to the direct (or indirect, covert inattention and willful negligence) of people who — for lack of a more defining term — seem to exhibit and manifest all the symptoms of both Narcopathy and Sociopathy as comorbid conditions (meaning they have a dual diagnosis that greatly enhances their own ability to act like caustic saboteurs and circus monkeys. And that is why it’s even more important now than ever for victims of Narcissistic Sociopaths and other social predators to come forward and share their experiences and subjective testimony about not only their own C-PTSD and related side effects but to dish dirt unemotionally about the habits, behavior patterns, and seemingly overt or covert core nature of Abuser and Abuse Enablers. Victim silence is the abusive person’s most effect weapon. Victim shaming runs a close second.